We all love the idea of being able to make a bit of extra cash on the side, without, you know, working too hard for it. For many people, a steady second income that comes in each month without requiring constant effort and attention is the dream. The thing is, it’s entirely possible to make more money without having to completely disrupt your life or take huge risks. Side hustle opportunities are all around you, and the only thing required is a bit of creativity, enthusiasm and the willingness to try. To help inspire you to find your own second income stream, I’ve put together a list of hacks and ideas that might just spark a great idea and help you start earning more. 1. Appify your job (and sell the app). Almost every job consists of at least some repetitive tasks that can be mapped into a workflow that can be streamlined using an app. When you really analyze things, you often end up realizing that the “human” part of it (the part that relies on our creativity, experience and/or skill) is actually quite small — but this is often the part we need the most help with so there’s a value add gap. An app that breaks up the process of writing a blog post into these constituent parts might then be able to offer additional value by helping with ideas, or offering a marketplace for commissioned articles (e.g. brands might request a specific article, which shows up in the bloggers ideation section). Basically, it could help writers, editors and publishers move through each phase quickly and easily, streamlining the entire process. And, in fact, the writing part could be sent off to one (or more) copywriters, because the concept and research is already available for them (from steps 1 and 2). This would allow the person driving the process to focus on areas of their own strength and collaborate with others where they are weaker. An app could convert the entire process from one long laborious task for a single person, to a slick, streamlined process executed by virtual teams — but it doesn’t only have to apply to writing and blogging. It could be anything. It could be your job. Google causes a lot of pain in the small business world. One day your site is happily chugging away, with visitors flowing in from Google search results, the next, it all comes to a grinding halt. Many webmasters rely quite heavily on valuable search traffic from Google. When Google changes its mind and decides to stop sending traffic, there is little to be done. Sure, you can try fix any obvious problems — but sometimes there aren’t any. The fact of the matter is that Google can, at any moment, change its mind about where it sends web traffic and it doesn’t have to tell you why. This can, quite literally put people out of business. As sad as this is, there is also opportunity for you to make some extra cash. Often, these penalized domains are left online with all their content intact. The owner or webmaster has moved on to other things, the website generates no revenue, so it no longer has any value to them. Under these circumstances, it may be possible to purchase the domain and website for next to nothing. Since your financial risk is very low, it may be worthwhile doing a bit of spring cleaning on the site. Spruce it up a bit. Fix up some of the content. Get rid of any bad backlinks, etc. You never know what might work. As quickly as Google decides to put someone out of business, it can change its mind and start sending traffic again. Here’s a screenshot showing how my traffic recovered (for no reason that I could find) after three years of being penalized (to the tune of 97 percent of the original traffic). The point being that, if someone had approached me and offered a few hundred bucks for the site while it was penalized, I would probably have taken it. And there are thousands of sites out there in the same position. What’s nice about this particular idea is that it is essentially online and passive, with (hopefully) very little required in the way of initial capital. Normally, I would say that building a truly passive income online takes a lot of hard work, but if you have a good eye for quality sites that are clearly undervalued (preferably for a reason you can identify and fix) then it’s entirely possible this is a fast and easy way to generate a fantastic income. How you go about finding potentially underpriced sites and blogs is another story because, by definition, they aren’t easy to find on Google. It’s a good idea to turn to some online SEO resources that can help indicate web traffic levels, such as Amazon’s Alexa or Moz’s Open Site Explorer. 3. Work as an affiliate for some of the best brands in the world. Some of the biggest and best brands in the world have affiliate programs (Amazon, Microsoft, Staples, Sears, Office Depot, Wall Street Journal, Dell and Disney, to name a few) designed to help them reach more potential clients and customers. These affiliate programs pay handsomely for anyone you send to them who makes a purchase, signs up to their service or completes some other desired action. It’s like getting a job in the sales and marketing department of that company, without having to go for a formal interview. Or leave the house. Or put on pants. The job is commission-based only, of course. There’s no basic payment. But, there’s also very little financial risk, because it’s completely free to sign up. Plus, you can do it whenever you like. Affiliates have no stipulated hours of operation. Most affiliates work online via their blogs or social media profiles and this means that, assuming you can interest people enough, your content can generate revenue for you while you sleep. Making money blogging is a simple equation: The more visitors you can get, the more money you can make. However, getting lots of visitors is difficult because Google won’t generally send valuable organic traffic unless it can see you are already quite popular, by looking at who and how many people link to your site. 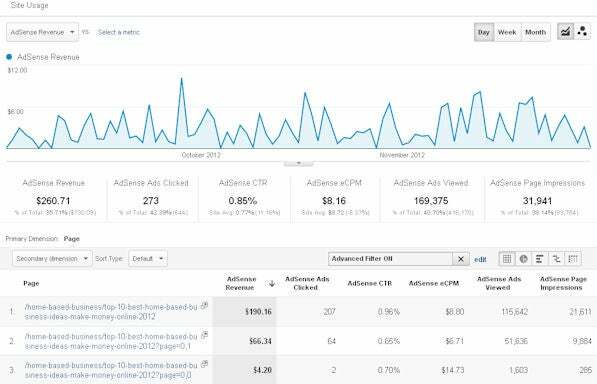 As you can see, the blog post, entitled Top 10 best home based business ideas to make money online, earned $260 for a single quarter, which equates to around $1,040 per year in AdSense earnings alone. Factoring in affiliate commissions and direct advertising revenue generated from visitors as they clicked on links and ads and browsed around, the total ended up being in excess of $2,000 per year. Now, assuming it took me four hours to write the article, that works out to an hourly rate of $500 per hour, per year, for as long as the blog post continues to generate revenue. That’s a pretty good rate. Except, it’s almost impossible to get every article to succeed. Not every post will climb to the top of the search engine results, or go viral. The trick to making a good living is to write great content that has a chance of doing well, promoting it as best you can (which requires a decent content and influencer marketing strategy) and then capitalizing on the traffic that your site does generate by tweaking content to improve conversions and user experience.